I recently had the honor of a special taste testing of Sweet Grass Dairy cheese and Emily G's jams a few weeks back at The Family Dog in the Morningside neighborhood of Atlanta. For those not yet in the know, Sweet Grass Dairy is situated in southern Georgia and makes incredibly delicious cow's milk cheese. They utilize New Zealand style rotational grazing, as the cows are moved every 12-24 hours to feast on various Georgia grasses. 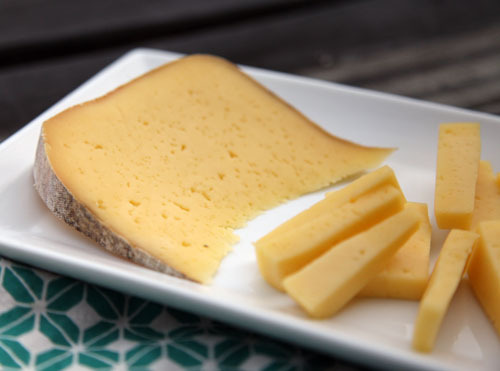 Their most versatile cheese, the Thomasville Tomme is made in the style of a French mountain Pyreneese Tomme. As stated on their site, "The higher butterfat milk provides this cheese with smooth, rich and buttery characteristics. It's finish is tangy and slightly salty." I love to add a little something to cheese and Emily Myers' line of bold and tasty jams bring instant gastronomic happiness. Emily is one of my favorite people in the world, made better by her culinary savviness, witty banter and love of a good cocktail. Her Bold Blue is made with blueberries plus an added kick of chilli pepper, cumin and a touch of cayenne. Bold, sweet, surprising- I'd say that's much like Em herself. I love the Sweet Grass Asher Blue cheese. It has an incredible flavor- part earthy, part sweet. It's distinction lies in its mild finish and is a cheese that must be tried. I could feast on cheese and jam all day! A big thank you to Emily, Mat of Sweet Grass and the owners of Family Dog- such a fun outing for an afternoon. Click here to learn more about Sweet Grass and here for Emily's jams, sauces and seasonings. Buy tickets here, before they sell out!